Rosetta Stone is an easy-to-use language package that even the most dyedin- the wool Brit will be able to manage. The software is available in two formats: as an online course for which you pay a subscription, or as a CD-ROM. The languages are available in two levels: Level 1 is equivalent to GCSE standard and Level 2, which is comparable to A-level. For this review we opted for the French course. 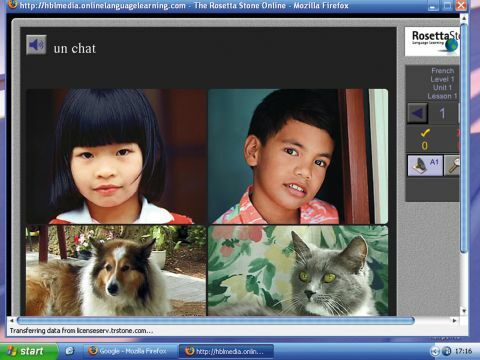 However, Rosetta Stone offers courses in 29 languages, including German, Italian, Mandarin and Arabic. Unlike school language lessons that involve the repeating of verbs and nouns, Rosetta Stone educates you by displaying pictures - you then have to say what you see. For example, you see a boy running, and hear and see 'Le garcon court'. You may not know the verb 'to run', but by seeing the picture, hearing the phrase and also by seeing the text, you work it out. This may be pleasant news to anyone who still has nightmares about conjugating être and avoir verbs, but for those who want to be able to do more with the language they're learning it's not much help. By following the steps you may well be able to say, 'Les files courent après les garcons', but you won't necessarily know why the verb to run has a different ending. Rosetta Stone enables you to try out some of the phrases for yourself. The software plays the sentence and you then have to repeat it. When you hear the phrase you also see a waveform and then see the same for your attempt. Although this is useful, when you complete the tests it's not clear to you how well you've done. Rosetta Stone is a different way to learn a language. However, we could only progress because we already had a basic knowledge in the language we chose. If we had tried Mandarin, we're not sure we would have been as successful.